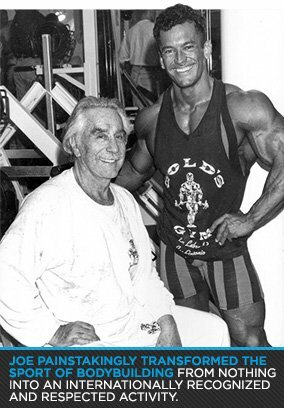 Joe Weider and I met at the 1985 IFBB Mr. Universe in Gothenburg, Sweden. I had just finished winning the contest, and had been awarded my first-place trophy by his brother, Ben Weider. Joe was waiting by the side of the stage, and I couldn't wait to have my photo taken with him. I didn't want to miss my chance to introduce myself. It all seemed surreal at the time, because Joe was a legend to us bodybuilders. After all, he was the Master Blaster, the guy who, along with Ben, painstakingly transformed the sport of bodybuilding from nothing into an internationally recognized and respected activity. Meeting Joe and having my photo taken with him was one of the highlights of my trip. A couple of weeks later, Joe flew me out to Los Angeles for my first photo shoot for Muscle & Fitness magazine. I'll never forget it. Joe always attended the cover shoots, no matter how busy he was. Joe preferred to direct the bodybuilders, models, and photographers himself. He had an uncanny eye for detail, and would always move the bodybuilders around on the camera set until they looked just perfect. Often it was just changing an angle a little here and there, but you knew that with Joe on the set, the photos would be awesome. Joe Weider loved bodybuilding and bodybuilders. He was paternalistic by nature, dispensing advice to all of us. Joe wanted us to succeed, not only in bodybuilding, but in life. I have fond memories of Joe's giving nature. I owe much to Joe for affording me the opportunity to appear in his magazines, endorse his products, and become a "Weider athlete." If they were willing to work, Joe gave every bodybuilder the opportunity. He didn't give handouts, much to the chagrin of the freeloaders who mistook his generosity for charity. Unfortunately, the bodybuilding culture, like humanity in general, has its share of those types. The Los Angeles Times article on Joe's passing mentioned that, "While he had staunch supporters, he also had critics, who complained about his outsized ego and bruising business style." Joe had a healthy ego, sure, but he wasn't arrogant or obnoxious. In fact, he was pretty down-to-earth. He was never unfair to me in business. He did the things that smart businessmen do—nothing more and nothing less. 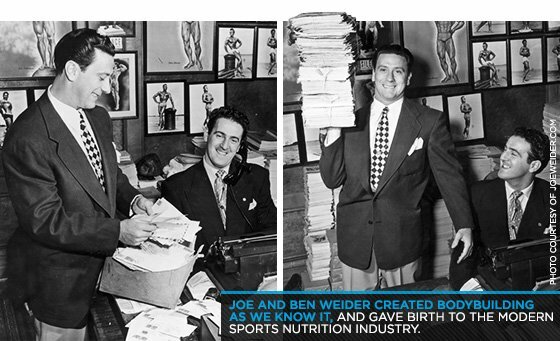 Without Joe Weider and his brother Ben, bodybuilders might still be relegated to an afterthought at a weightlifting tournament. The Weiders created modern bodybuilding as we know it and gave birth to the modern sports nutrition industry. Once I retired from bodybuilding competition in 1995, I set out to grow one of the most successful sports nutrition companies in the world. Again, I have Joe to thank in part for that opportunity. I applied the things I learned working for him to what I do every day. Joe was proud of me for successfully transitioning into my business, Labrada Nutrition, and often told me so when I saw him at the Mr. Olympia competitions, which Joe attended as long as he was physically able. I have a copy of Joe and Ben's book Brothers of Iron on my desk. On the inside of the book, in Joe's handwriting, are the words I love you, (signed) Joe Weider. I'm looking at it right now, and I'm choking back tears. I love you too, Joe. I love you, too.